Stop Press 30 Jun: For anyone who might be in the Australia of New Zealand teams for the challenge, the areas described below are embargoed from now 30 June until the events. Stop Press 27 May: Australia has accepted the challenge. We can surely expect as many Australians as kiwis who attend big events over there - up to 30. Plans for a MTBO carnival in Otago were hatched during the last trip over the Tasman, and a group of Christchurch riders scoped some areas last summer. Then there was an earthquake. However the phoenix has risen from the ashes, dates finalised, and a challenge has been issued to Australia. The important dates are 10-14 Jan with informal events on either side. The Great Southern Brevet. A brevet is an unsupported bike ride of several days. This one is 1200km long, starts and finishes at Tekapo South Canterbury, and winds through the MacKenzie Country, Central Otago, Southern Lakes, northern Southland and back through Central Otago to Tekapo. Uses many historic routes, each one of which would be a challenging ride! Begins on 21 Jan. The Otago Carnival website has been opened. 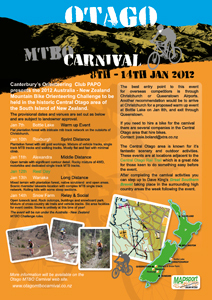 The Otago MTBO Carnival in Jan 2012 is an Australia-New Zealand Challenge. For anyone who might be in the Australia or NZ teams, the following areas are embargoed from now 30 June 2011 until the events. When considering whether this applies to you, please note that there may well be a range of abilities in the teams. It is up to Australia as the travelling nation to choose which age classes to contest, from -20, open, 40-, 50-, 60- and 70-, in both sexes. Both countries may find themselves selecting riders who would not regard themselves as particularly “hot”, especially as a number of experienced riders will be involved in mapping and planning. So all interested in the carnival are urged to avoid these areas except as specifically noted, or as authorised by the NZOF MTBO Convenor. It will make the events more challenging anyway! Roxburgh. The area (over the river from the town) bounded by Roxburgh East Rd, Ladysmith Rd, and the Clutha River. This is the area used by the NZ Sprint Champs in 2010, and the Otago Middle Distance Champs in 2011, and the foot-o map will be made available in due course. Alexandra. The area (over the Manuherikia River from the town) bounded by the Manuherikia River, Manor Burn, Little Valley Creek, and the NZTM grid line 4980000. This area is variously known as “Linger and Die” or “MTB Heaven”. Access to residences and the Shaky Bridge Cafe near the river is allowed. Use of the Central Otago Rail Trail though this area is allowed without deviation. Wanaka. The area (north-east of the town) bounded by the Clutha River, Gunn Rd, Aubrey Rd, and the northern suburbs of Wanaka. This area contains areas known variously as Sticky Forest, The Plantation, Hikuwai Conservation Area, Hogans Track and the Outlet Track. Access to residences within the area is allowed. Use of Outlet Rd and the Outlet Holiday Park is allowed but exploring nearby is not. Cardrona. The Snow Farm, Snow Park, and Southern Hemisphere Proving Ground on the Pisa Range. Access to the first two is allowed when the Snow Farm and Snow Park are operating (ie there is snow on the ground) and a ski-o map of part of the area will be made available in due course. There is a route to the Pisa Conservation area defined by orange markers and this is allowed without deviation, snow or not. We don’t want to stop locals enjoying their favourite rides or normal access arrangements, so if you have any questions please contact or the Nominations for the team will be called for in a couple of months. This page was assembled by and updated on 30 June 11.